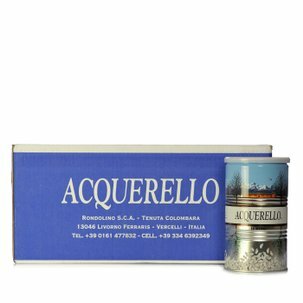 The Acquerello rice: flavourful and simple to cook, it is the right ingredient to always have available. Characterised by a stable starch that does not dissipate while cooking, its grains do not become sticky, which is the guarantee for an excellent result. But the main characteristic of this rice is its ageing process, which is responsible for the unique flavour that sets Acquerello apart. Truly complete from a nutritional point of view, this rice is rich in protein, minerals and vitamins that are fundamental for our body. If you are passionate about Carnaroli rice from Acquerello don't miss the pack available from Dispensa di Eataly! Ingredients Aged and enriched Extra Carnaroli rice For more information on product labels, please contact our Customer Service department. The information on the labels of the products may vary for reasons beyond our control, therefore, there may be discrepancies between the information on the site and that on the products delivered. Please always check the information on the product before consumption or use. Tenuta Colombara only grows high quality Carnaroli rice, entirely from organic farming. Piero and Rinaldo Rondolino complete the ageing process in the silos. By ageing the rice, it becomes more consistent and absorbs the condiments better. It is packaged in vacuum tins.